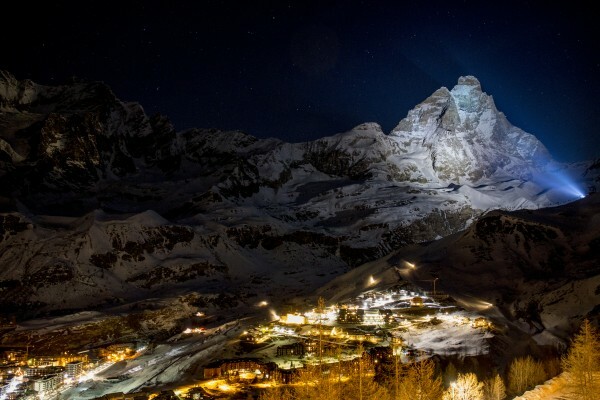 BREUIL-CERVINIA VALTOURNENCHE ZERMATT: SIX MONTHS OF SKIING ON THE LONGEST SKI SEASON IN THE ALPS. 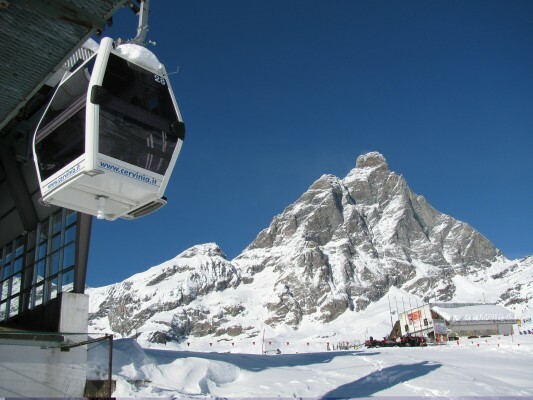 Cervinia has something that no other resort can offer: the possibility to ski from October, on the weekend of the 20th and 21st, and from the 27th of October until the 5th of May 2019 every day. Six months solid of skiing. And on snow which, thanks to the altitude of the district, not just in winter but also in spring, never fails to live up to expectations, guaranteeing the finest quality. There is never a lack of fantastic snow here and, along with the variety of slopes and connections between Cervinia and Valtournenche and Zermatt, in Switzerland, it has made this district, which goes by the name "Cervino Ski Paradise", one of the most popular destinations with skiers from all over the world. 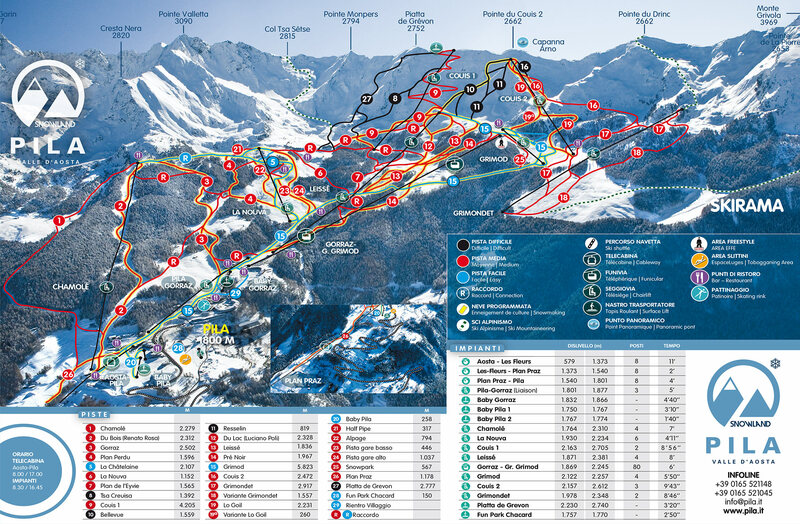 Thanks to the extensive network of lift systems and pistes, it is possible to reach three localities without ever taking your skis off, admiring the Cervino/Matterhorn from both the Italian and Swiss sides, letting yourself be captivated by the amazing food served in the many restaurants scattered along the slopes. State-of-the-art lift systems make it possible to reach the peaks quickly, taking in the beautiful views all around. Just think of the cable car (125 passengers) which leaves the Cime Bianche Laghi station in Cervinia and climbs to the 3,500 metres of Plateau Rosà, or the "Pancheron" chair lift, also in Cervinia, which arrives under the crests of the Furggen, allowing you to almost reach out and touch the tip of the Matterhorn. Not to mention the legendary decent of the Ventina, from Plateau Rosà to Cervinia town: a piste which, as well as being one of the most famous in the world for its length, open completely to skiers, is renowned for the beauty of the surrounding landscape. And it is thanks to the wealth of snow that freeride has become a must, a veritable cult for fans, who can ski off-piste in powdery snow, zigzagging or surfing the vertical slopes, from an altitude of four thousand metres down. 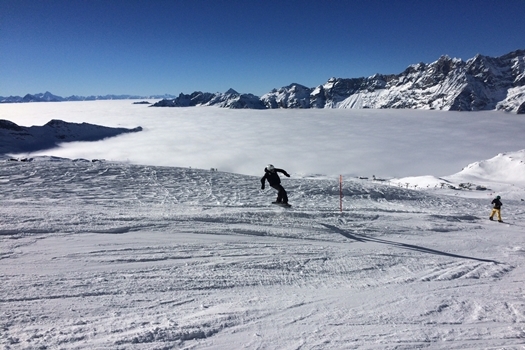 With this snow, snowboarding is absolutely fabulous here, in the district’s accessorised snowparks; like children’s skiing at "Cervino Ski Paradise", it is synonymous with absolute fun, with play parks where you can learn in complete safety, under the watchful eye of the most patient and talented ski instructors. 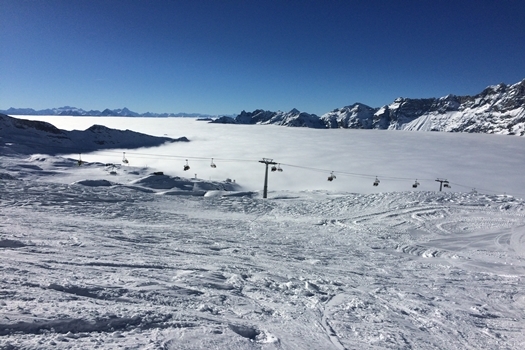 There is another added value which makes this district unique in its kind, in addition to the pistes and connections of course: the “real” mountain environment, which changes with the change in altitude. From the eternal snow on the glacier at Plateau Rosà, to the larch forests of Valtournenche (1,500 metres) the slopes of which, many running through the woods, are a tribute to the delights of un-repetitive skiing. You can quite easily come across chamois goats, ibex and marmots by the side of the slopes, and looking up to the tall peaks of Grandes Murailles and the Cervino, you might also see eagles in flight, at home in the skies of "Cervino Ski Paradise". A ski safari and an immense nature reserve, where skiing becomes a unique opportunity to observe the local wildlife. Special events include “moonlight descents”, organised when the moon is full, or “prima traccia” – an ascent with the very first cable car, before the system opens, leaving your mark on the snow before anyone else! Waiting for the sun to rise. Events which make this district even more perfect for an all-round skiing holiday. ONE SKIPASS FOR "CERVINO SKI PARADISE"
"Cervino Ski Paradise" is more than just Cervinia, Valtournenche and Zermatt. The district also includes Chamois and Torgnon, despite the fact that they are not connected to each other by lifts and pistes. They are stations with an added value created by the excellence of the locations: the village of Chamois is accessible “only” by cable car, and Torgnon, the "pays du soleil", is the ideal place for families with children. To appreciate and discover these “small stations”, Cervino S.p.A. proposes separate ski passes which offer more choice to suit individual requirements. 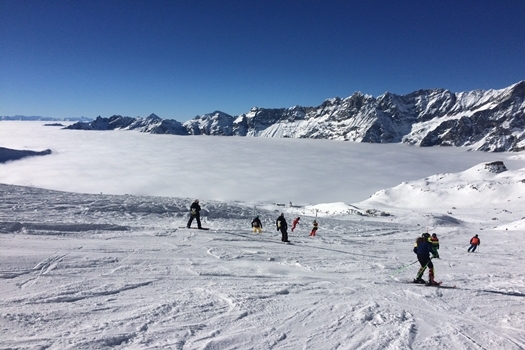 The classic “international”, which allows free movement on the Cervinia-Valtournenche and Zermatt systems, as well as Chamois and Torgnon, the “nationals” (Italy), which allow free access to the Cervinia-Valtournenche-Chamois-Torgnon, Valtournenche-Chamois-Torgnon or Chamois-Torgnon systems. 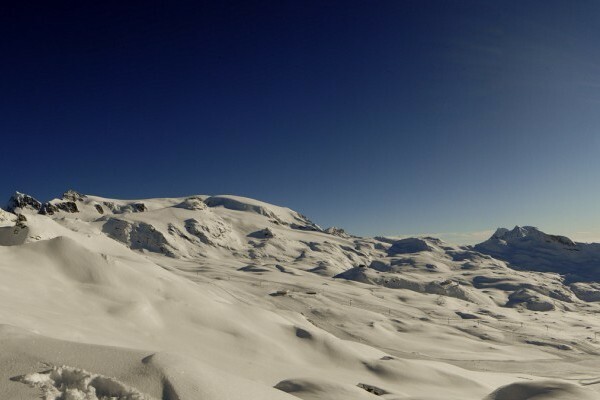 BREUIL CERVINIA (mt.2.050 ) AND VALTOURNENCHE (mt.1.500) : WHERE THE SKI IT’S WITHOUT LIMITS. 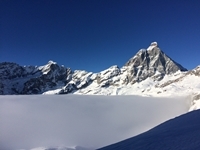 The highest Alps’s ski area , watched over by the Cervino mountain , lots of ski slopes all connected without take off your skis : Breuil Cervinia and Valtournenche, with Zermatt, on Switzerland side, are the queen’s of this one ski- total with no limits, the only one for the snow quality . 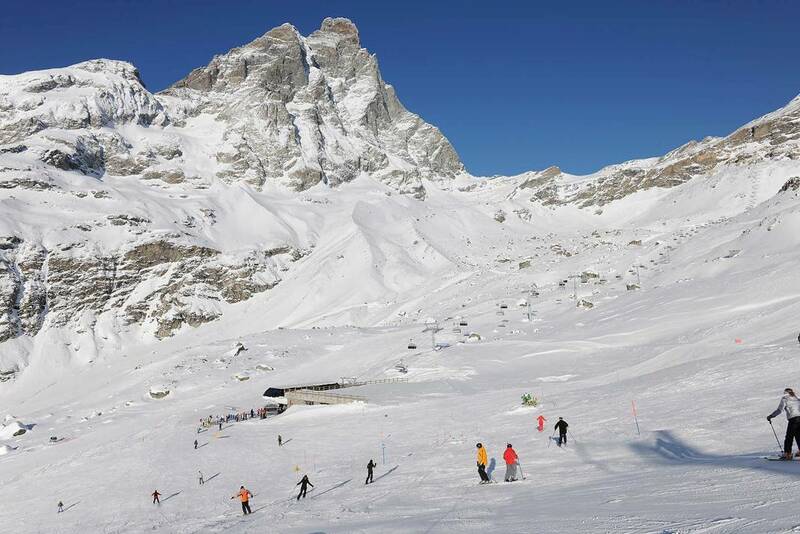 Breuil Cervinia and Valtournenche are from ever the only one point of reference for the ski’s lovers . Here the winter season it’s six months long , from the end of October to the beginning of May thanks to the hight of this ski area , from the 1.500 mt of Valtournenche to the 3.883 mt.of the Klein Matterhorn (Switzerland) . The name of “Cervino Ski Paradise “ gave to this ski area represents the best one synthesis of a fantastic holidays’s offers that it’s synonyms of snow’s and ski slope’s quality. The connection with Zermatt (Switzerland) it’s guarantee by the 120 places’s Cable cars from Cime Bianche Laghi to – Plateau Rosà ( mt 3.500) and the chairlift Bontadini that, with Plan Maison and the Fornet , (all three fourplaces’s chairlift with the bubbles’s protection ) , that three systems , provide also the sunny ski slopes on the ski area of Plan Maison, where , it can finds lots of traces of differents levels . For all skiers that want to admire the imponent figure of the Cervino with its characteristics South face, the six places’s chairlift of the Pancheron ( six places , protection’s bubbles and children’s security system ) , brings all the skiers to one of the most exclusive place in Breuil , under the Furggen Mountains , from here the skiers ,can return in Plan Maison, or also “coming down “ to Cervinia town, skiing on the one zone called “ The Rocks’s City “ , to upcoming from the centre town again to Plan Maison, (without take off your ski ) using the Cretaz and the Pancheron’s Chairlift. It’s without doubt the Ventina’s ski slopes ( the one that start from Plateau Rosà) the best known by all the skiers , for it’s 11 Kilometres long , characterized by the hard walls, ( terrible the beginning s) alternate by long Schuss that are the most hardous for the legs. The arrivals it’s at the departure of the cable cars from Breuil Cervinia to Plan Maison. 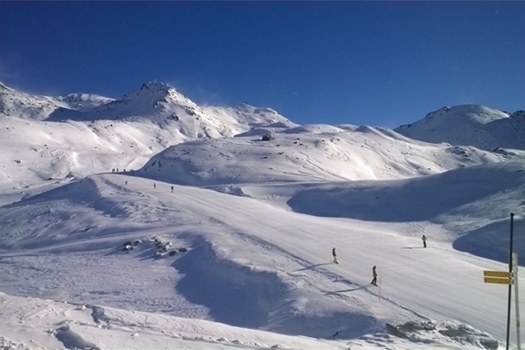 The Ventina’s ski slopes , on it’s descent , pass over the Cime Bianche area , with lots of intermediate ski slopes of the Goillet’s Chairlift, from here, it is possible to have the access on the Valtournenche Ski area , that offers various kinds of traces . The “ Big one Slope” coming down to the centre town ( mt 1.500 departure of the Salette Cable cars ) It’s a “must” the long one descent from the klein Mattherhorn to Valtournenche , passing first from plateau Rosà, then on the Ventina slopes, to the Valtournenche area and latest, arriving to the departure’s station of cable car (12 places, K\h 2.400 persons.) with a wonderful trace that it’s generated by the unended glaciers of the Highs to the particular “Forests” that underlines the final part of the “ Big one Slope” , with a magnificent Highers’ view of the Village, Wonderful and the Best one!! Breuil Cervinia and Valtournenche, the two resorts of the Cervino’s South face (therefore with ski slopes to the sun) owe their fame of big station’s for the confort of the ski slopes access and the return with ski to the town, obviously, also thank’s to the modern lift systems ( 54 on all the ski area) with an hours capacity of over then 91 miles persons .But not only: Breuil Cervinia (mt 2.050) it’s an International resort, rich in Restorants and Bar, for an After Ski never repetitive. Valtournenche (mt 1.500) ,instead ,it’s a typical mountain town , with it’s small village around and where it seems that the time it was stopped. The two resorts are far not more then 1o kilometres each one by the other, easily by car. From the 5 stars to the 2 stars : the Hotel’s offers ( Hotel and Residence ) of both the satisfied all inquiries request. The structure are well groomed facilities , lots of that one respecting the rustic and mountain style of the Rascard, typical olden Aostan building . In this area between the old and the modern , the wonderful Hotel’ s Beauty farm (with a swimming pool ) guarantees the best relax after the ski’s performances. So qualificated services of a therapeutics massages , with a therapeutic massages with sludge, or chocolate , adds pleasure and relax to the holiday, also for them that are not sports. The traditions of the Italian’s cuisine ,with the discovering of the Aostan food and wines. A fantastic mix of proposal (without forgotten the International cuisine taste).Many bar and Restaurants on the ski slopes offering a taste , appetizer, lunch and dinners , arriving with the ski-du. Walking on the Breuil Cervinia and Valtournenche’s street it’s not possible to haven’t a purchasing : in the Boutiques there are the best and famous Sport’s, and wear’s brand, as in the shop it is possible to have an enormous choice of food and Italian’s wines also, of course , a traditional artisanal objects home made . At feet of the Cervino everything it’s based on sport. 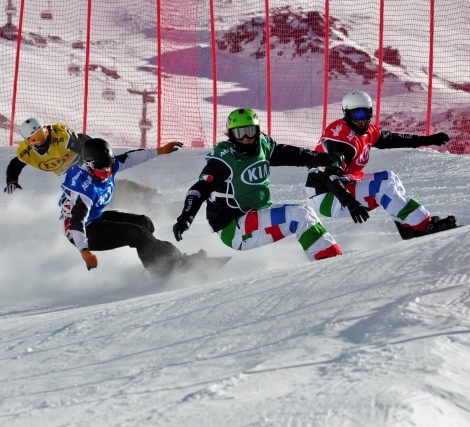 Not only alpine ski but also the snowboard inside the equipped snow park in Breuil Cervinia, where make the freestyle, the ski cross and the snowboarder cross. It’s possible make the Eliski (from December to the middle of May ) for days all dedicated at the freeride, starting from the 4.000 mt. Without forgotten the exclusives descents under the moonlight ( not before a romantic dinner in a mountain chalet ) or also “the first trace”, the ski “before” the opening hour of the lift system ( the only one obligation and requirement: must be early riser!!) . But “Cervino Ski Paradise “ means also cross country ski and snowshoes, and Alpinism ski on a perfects traces reported , prepared, and reserved . 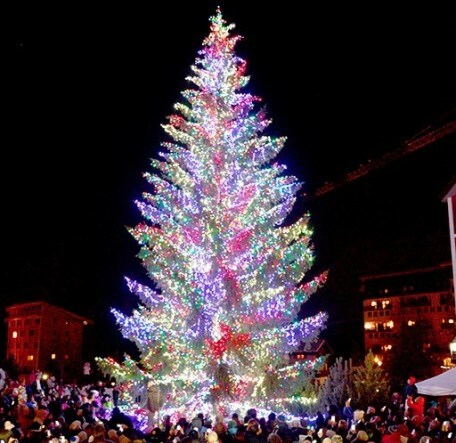 In Breuil Cervinia it’s “on” the “ Ice Kart”, kart on the ice also for children’s and lighted during the night.